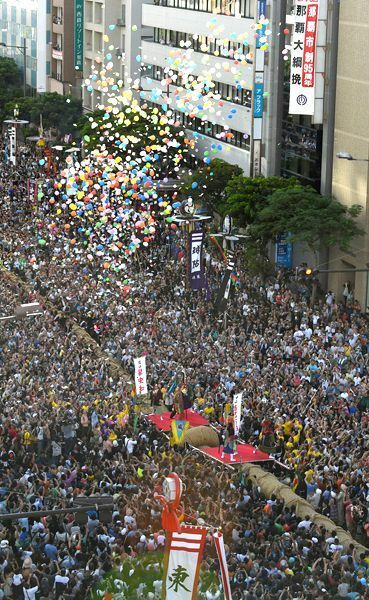 At 4:33 p.m. on October 9, about 15,000 people took part in the Naha Tug of War at the Kumoji Intersection of Route 58 in Naha (Photograph taken by Yasuhide Matayoshi). The 46th Naha Tug of War was held at the Kumoji intersection of Route 58 in Naha on October 9. According to the organizer, about 270,000 people took part in the event. The crowd pulled on the rope for 30 minutes, with the West side winning the　competitive match. The East and West tied overall with 14 wins, 14 losses, and 15 draws. The rope used in the tug of war is 200 meters long and weighs about 43 tons, and is recorded in the Guinness World Records. About 15,000 people took part, pulling hard on the rope. This year marks the 95th anniversary of the establishment of the Naha municipal government and the 72nd anniversary of the October 10 air raid. With the 6th Worldwide Uchinanchu Festival at the end of October, the Naha Tug of War attracted not only domestic and foreign tourists, but also many Okinawan descendants here to take part in the festival.